UK’s Goplasticpallets has invested in a thermal printing machine to meet the increasing demand for branded totes and trays. The company plans to produce boxes with printed identification markings in smaller quantities. While, traditionally, printed containers were only available in large quantities resulting in long lead time, but small boxes and small quantities increase flexibility, noted the company. GoPlasticPallets has invested in a new machine Coditherm H-PAD. With this machine, the company can now offer flexibility and printing in small batches, as small a few hundred units for its customers. These small orders could completed within three working days. Coditherm H-PAD thermal printing machine, is a pneumatic printing machine, which uses high-power, thermal transference to print on recessed areas of structured plastic containers. It is claimed to be ideal for printing Automotive KLTs, Euro containers, food-grade boxes and bail-arm crates. The new machine has been installed at Goplasticpallets’ main warehouse in Eastbourne, which is home to the company’s stock inventory and operatives. The company says that the machine can accurately print logos and identification markings such as part product numbers, barcodes, SKU and QR codes. As per Goplasticpallets, one of the major benefits of the thermal printing machine is its ability to print on diverse materials such as Polyethelene (PE) and Polyproplene (PP) and within very small margins. 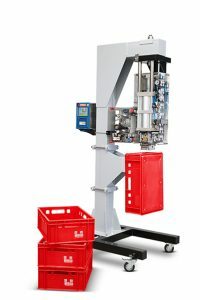 The distributor of returnable plastic transit packaging (RPTP) is said to have witnessed significant growth in the recent years and expects that with the installation of this machine, it can grow further with the fast turnaround time on printing small containers offered by the machine. Goplasticpallets managing director Jim Hardisty said: “We’ve seen a growing demand from customers across all industries for a printing service that not only responds to their needs quickly, but enables them to purchase containers and totes in small quantities, with specific identification markings. Image: Goplasticpallets’ thermal printing machine, Coditherm H-PAD. Photo: Courtesy of All Pallets Ltd.